Shadow of the Tomb Raider is all about duality. The title alone hints at light versus darkness, but further dimensions to this can be found by looking to its developer. This is the first game since the 2013 reboot that hasn’t been led by Crystal Dynamics and that marks a significant change. Crystal Dynamics remains a guiding hand in Lara Croft’s fate, but the reins for this game have been taken up by Eidos Montreal, the team behind Deus Ex: Human Revolution and Mankind Divided. Those were games all about choice, often ones with dual outcomes: stealth or aggression, peace or violence, machine or biology. The ideas in these games are all over Shadow of the Tomb Raider, like a meddler’s fingerprints, and it’s all to the game’s benefit. 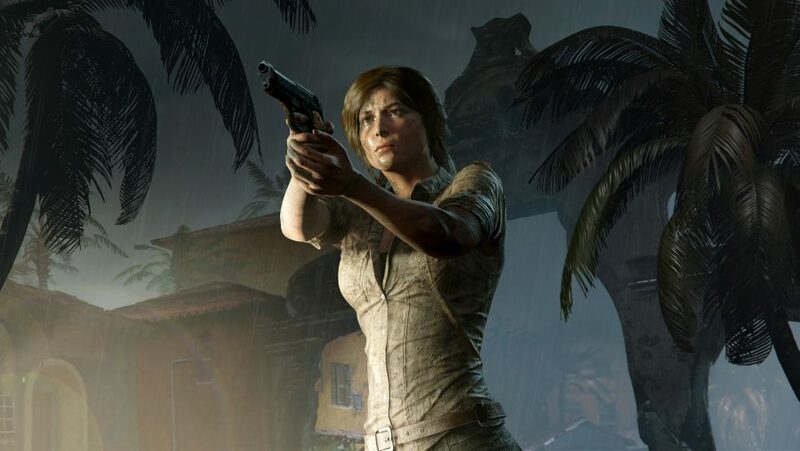 When Shadow of the Tomb Raider was first revealed to the world, we were shown a much more aggressive, obsessive Lara. She is now a woman without her previous apprehensions, more confident in her climbing and acrobatics, and significantly more ruthless as she takes down her armed opposition. But she gets too caught up in competing with her treasure hunting rivals, the Trinity organisation, and forgets archaeological best practice – she accidentally triggers the Mayan apocalypse. This shift in personality split opinion, with many unsure if a moody, arguably petulant hero was warranted. 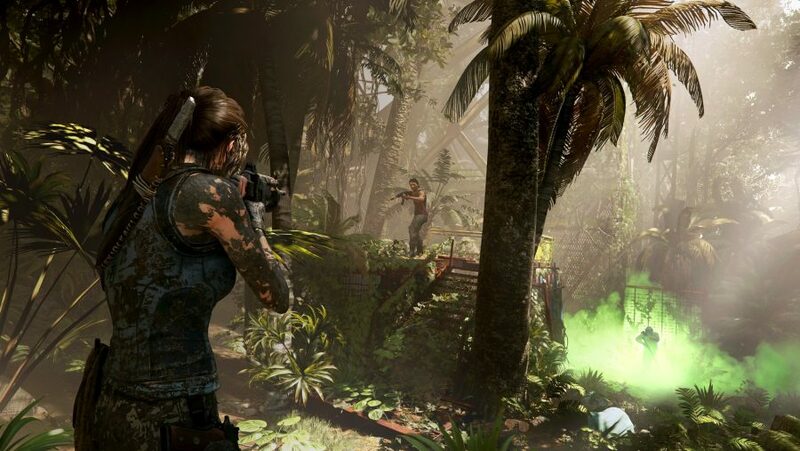 But the hours following the game’s grim opening, which I was able to play at a recent hands-on event, emphasise that Shadow of the Tomb Raider hasn’t made Lara completely grimy. Rather, where the opening demonstrates her deepest flaws, the later chapters go onto highlighting her more human, loving qualities. Understanding the mistakes she’s made, the subsequent hours see Lara attempting to desperately course-correct after her hasty actions set the world on a collision course with disaster. It’s clear that the titular shadow will be a significant part of the game’s narrative, but in order to cast that shadow there needs to be moments of light, too. Demonstrating this are some genuinely affectionate moments between Lara and her most trustworthy companion Jonah, as the pair become lost in the Peruvian jungle. It’s a pleasing angle, and one that continues to build on an already three-dimensional character. The duality in her narrative arc comes across in gameplay mechanics, too. Lara’s headspace is occupied by anger and desperation to stay two steps ahead of Trinity, who has been responsible for so much of the Croft family’s misfortune. Combine this with the game’s primary setting of the jungle, and you’ve got the perfect setup for some predatory combat techniques. We already knew that Lara can now hide among vines and up trees, but the later hours of the game introduce the ability to coat yourself in mud to help blend into the jungle’s darkest shadows, and to string your opponents up, Batman-style, with rope arrows tied to the tallest branches. Stealth in the previous games often felt like the creeping opening to a larger battle, but now it feels like a genuine, fulfilling option for an entire fight. The tools at hand allow you to wage a war that feels more psychological, too, if only thematically, and thus combat is a little more rougher-edged than the cleaner, snow-capped battles Lara fought in Siberia. These new combat techniques are introduced via a battle with a jaguar. This acts as a pleasing homage to the original Core Design games, in which slaughter of the planet’s most endangered species was just another hour in the office for Ms. Croft. But under the surface of this encounter is a method of teaching the player what they should be doing with Lara to make the most of her new, more ruthless toolkit: keeping low to the ground, creeping up trees and rock faces, and striking from more unusual positions. Lara may lack a whip and fedora, but she's still packed all the necessary archaeological tools: bow, climbing axe, a rappel rope that allows her to descend into danger, and a inhuman pair of lungs that allow her to explore the new underwater areas. The jungle brings out Lara’s aggression, but her compassion can be found in the game’s hub zones. In Rise of the Tomb Raider, hubs acted almost like huge archaeological digs: open zones where crypts could be unearthed and dozens of collectables lay hidden just below the surface. In Shadow, while these elements remain, their structure is far more akin to the worlds Eidos Montreal has previously built in Deus Ex’s cities. After escaping from the jungle, Lara and Jonah find themselves in Kuwaq Yaku, a ramshackle riverside town teeming with life. While the area provides Lara with the clues she needs to continue her main hunt, there are plenty of people in need of help here. This forms a series of traditional side-quests – one I undertook involved rescuing children from the grips of a local crime lord – but considering the scope of the detailed environments, any excuse to further explore them is a good one. Lara’s skills are well compensated by the quest givers, but the real reward is seeing that, despite her position, Lara hasn’t lost her humanity. Rise of the Tomb Raider saw the series’ room-size tomb puzzles grow to impressive, intricate set-pieces, and Shadow evolves them into full-blown levels. While challenge crypts still exist as smaller side events, core narrative tombs are impressive, large-scale zones where puzzles interlink and require multiple levels of navigation. Towards the end of the four-hour play session, Lara was climbing her way up a mechanised totem pole, complete with rotating arms and billowing wind sails, with every jump at risk of being knocked aside by a swinging piece of timber. Not just visually splendid, the act of fitting the many mechanisms together is enjoyably fiendish, too. It’s easy to be concerned when a series passes from one developer to another, especially when its not part of a reboot. But while Crystal Dynamics isn’t the project lead this time around, Shadow of the Tomb Raider is no Batman: Arkham Origins. Eidos Montreal doesn’t settle for replicating the earlier games wholesale, and instead brings a variety of new elements to Lara’s adventures. 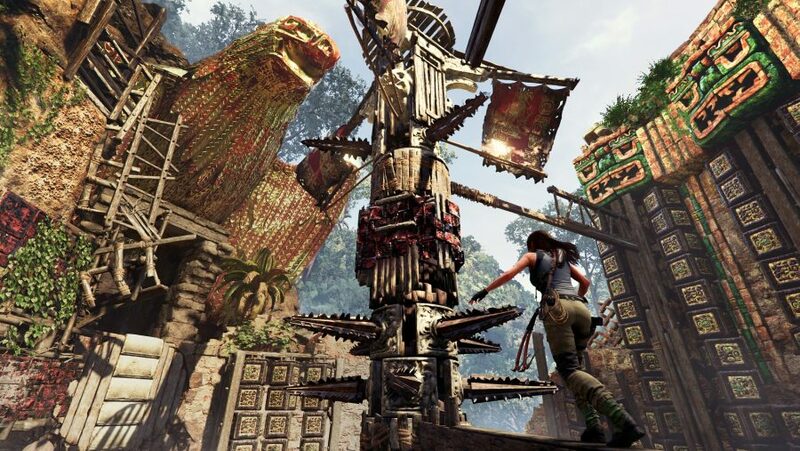 Mechanically, this is expressed by demanding more from you moment to moment – climbing and traversal frequently requires you to manually chain together Lara’s movement options, and puzzles have additional layers of complexity. But the biggest difference can be felt in what Eidos Montreal can bring from its own lineage. Its expertise in moral conflict and living worlds can really be felt here, and it’s that which buries any concerns I had about another studio crafting the conclusion to this trilogy.